The Malliyoor Sree MahaGanapathy Temple in Kottayam district, Kerala is the sacred abode of the all – encompassing divine presence of Lord Ganesha and also a coveted destination of lakhs of pilgrims from all over India. The endearing elephant – headed Lord Ganesha, the son of Siva and Parvathy, enjoys prime place among all the gods in the Hindu pantheon. He is Parabrahma incarnate, the God of Wisdom and Learning, the Remover of all Obstacles and is worshipped first, any other god. The Malliyoor Sree MahaGanapathy Temple is in comparable in the conception of the presiding deity as Vaishnava Ganapathy, with a young Sree Krishna seated on the lap of Lord Ganesha. This unique and powerful infusion of the Vaishnava spirit in the Ganesha idol is the supreme achievement of the devoted penance of the much-revered main priest of the temple, Brahmasree Bhagavathahamsam Malliyoor Sankaran Nampoothiri. Today thousand of devotees flock to the feet of Vasihnava Ganapthy at Malliyoor seeking eternal salvation form the bonds of Karama and solace from the evils of Kaliyuga. The Malliyoor Maha Ganapathy Temple is believed to have come into existence much before the Perumals exercised their sway over the southern peninsula. The pre-Perumal historical records have many references to the importance of this place of worship.The story goes that a deeply devout and saintly Brahmin brought the idol over here from an unidentified and unspecified pilgrim centre some where in the North, centuries back. The family-deities Anthimahakalan and Yakshi worshipped by the once-powerful administrators of the temple also find a place inside the temple complex. The temple is jointly administrated by two families, the Aryappally mana and Vadakkedam Mana. In course of time the two families were merged to Malliyoor and the Temple when went through a period of misfortune and penury, the Malliyoor family bearing a brunt of it. But they worshipped Lord Ganapathy with unwavering devotion even when the temple was without a root over the sanctum sanctorum and the family having a hand to mouth extensive. For quite some time in the past there was no structure except the sanctum sanctorum. A thatched shed served as the temple kitchen. But when that was eaten away by the elements the priest concerned cooked rice in his home kitchen and brought it to the temple as offering. This arrangement too later crumbled along with the priest’s own adobe. For about seven years after that, the temple was opened only once in a month to light the lamp and offer cooked rice to the deity.Once again a small house came up for the priest on a piece of plot donated by Brahmasri Kaithamattom Nampoothiri. Finally, the priestly family managed to have a hand-to-mouth existence, but the temple continued to be in its dilapidated state. In 1136 Brahmasri Sanakaran Nampoothiry’s father passed away. 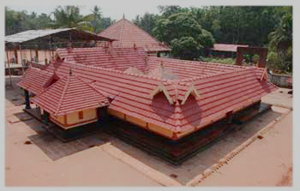 In the following months of his penance and abstinence, the renovation of the temple was taken up under the supervision of ‘Uamplakkad’ Nampoothiry, as per the architectural specifications of Palakkad Krishna Varier. The sanctum sanctorum thus got a roof. A fairly wide structure came up around the sanctum sanctorum. A kitchen, pantry and a short wall enclosing all these was soon completed. Then the work languished. These frequent interruptions might be indicative of a divine message. Astrologers were called in. It was found that Durga was demanding a place for herself in the temple. So a separate abode was erected for Durga Devi. Propitiatory and other traditional rituals were performed in the following days. Guruvayoorappan. He started to recite the holy text, ‘Sree Maha Bhagavatham’ in front of Ganesha and offering to his Lord. His intense prayer and the total supplication resulted in the infusion of the spirit of Mahavishnu into the idol of Ganesha. It was the finding of astrology. The deity here is conceptualised as Beeja Ganapathi, the trunk twisted rightward and carries on its tip a lemon, the hands hold an axe, a rope, a horn and a laddu, cradling little Sree Krishna in his lap. The Vaishnava spirit permeates the entire atmosphere.